Karen Letchworth here today with a thought......If you're anything like me, you've probably learned over the years that you can never have enough thank you cards on hand. There are so many times when someone does something nice where you just want to give them a card to express your gratefulness. However, if you keep thinking about it; your apt to forget to actually send that thank you card. So for that very reason, I like to have plenty of them on hand. And with all the fabulous ribbons, trims and decorative flowers available at Really Reasonable Ribbon; you can always be stocked up on the perfect accessories to get them ready to go. This card was created using some patterned paper, machine stitching, a white doily, a chipboard bird and journalling sticker, and a rub-on sentiment. I tied a length of Peach Baker's Twine around the card twice and tied a bow with it. This pretty peach color is so soft and subtle....GORGEOUS! The finishing touches were all the lovely Mulberry Flowers I used to frame the image. I used several of each of these Sweetheart Blossoms: Wild Orchid Craft Miniature Sweetheart Blossoms in Ivory. Two-Toned Peach, Full-Sized Ivory, and the lightest shade of pink from the Pink & White Mixed Assortment. I also tucked in a couple of the Wild Orchid Craft 30 mm Mulberry Paper Leaves, and of course I used lots of Scor-Tape to adhere everything. If you need to make some thank you cards; or, well really ANY cards (birthday, anniversary, sympathy, etc.) you will definitely want to stock up on some ribbons, trims, flowers and all the great products available in the Really Reasonable Ribbon store. 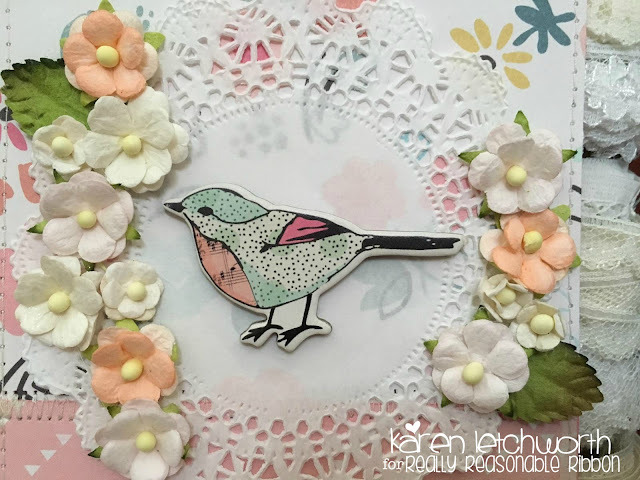 We'd also love to have you stop by to play along in the CURRENT CHALLENGE taking place now on the Really Reasonable Ribbon Blog. We love seeing your ribbony creations. Wow, Karen, this is so sweet. I love it! Karen: Very adorable and love the bird, doily and flowers on your beautiful card. 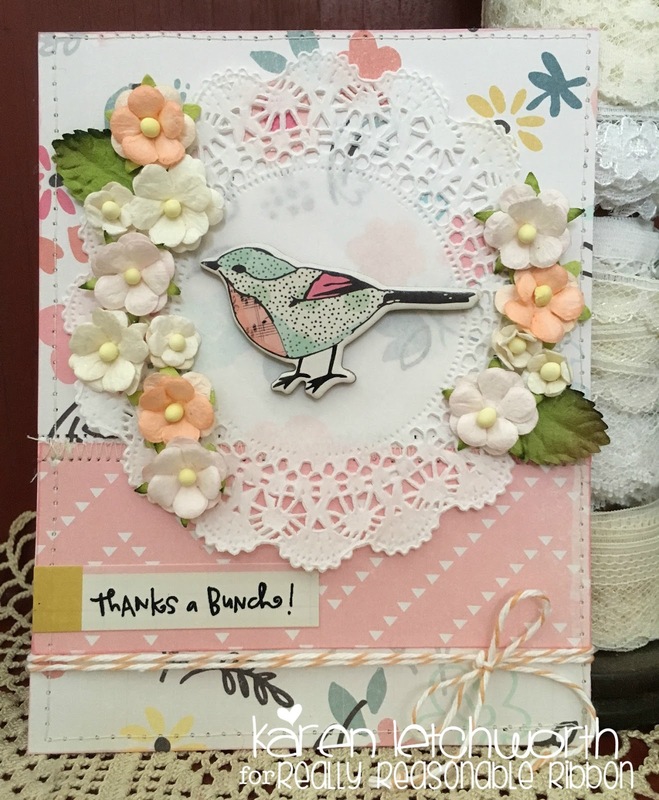 Oooh wow such a fantastic card I so love the image and the gorgeous colours you've used too. Really Reasonable Ribbon August Blog Hop Winner!